Discussion in 'Amateur Radio News' started by N8HM, Dec 4, 2018. Fox-1Cliff was successfully launched on Spaceflight’s SSO-A: SmallSat Express mission on a SpaceX Falcon 9 from Vandenberg Air Force Base at 18:34:05 UTC on December 3, 2018. Following deployment, the spacecraft was activated on schedule at 23:54:27 UTC. At approximately 00:30 UTC on December 4th, several stations in Brazil, including PS8MT, PT9BM, and PT2AP, reported hearing the voice beacon “Fox-1Cliff Safe Mode,” confirming that the satellite was alive. Just before 00:40 UTC, AMSAT Fox-1 Team Member Burns Fisher, WB1FJ, was the first to submit and upload telemetry to the AMSAT servers. Initial telemetry values show the satellite to be in good health. 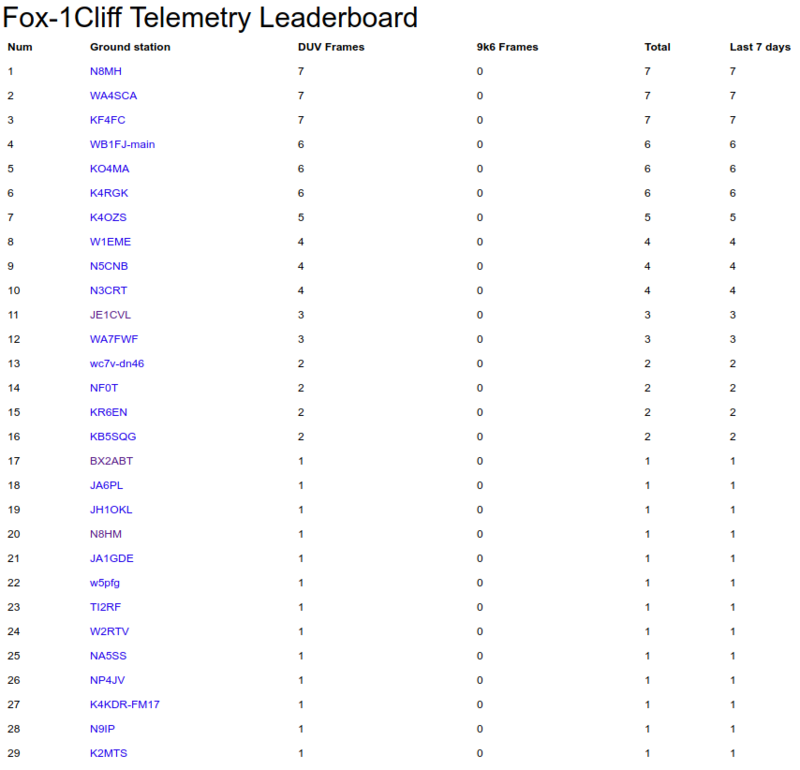 Thanks to the 29 different stations that contributed telemetry during Fox-1Cliff’s initial orbits. All stations are encouraged to please continue collecting telemetry during the commissioning process and are reminded not to transmit on the uplink frequencies until AMSAT opens the satellite for general use. The commissioning process is expected to take approximately 7-10 days. M0SWV, KA0HCP, W5PFG and 2 others like this. Congrats on the successful launch and initial deployment. Please clarify the statement bolded above. According to the AMSAT web site, the first GOLF program mission is to be the GOLF-TEE, hopefully launched in 2019. Support for FOX-1 Cliff should not have been derived from the separately designated GOLF fund, therefore that "coffer" should not need to be "refilled". Or are all donations to AMSAT simply lumped together into one big fund? If so, then the donation web page is misleading and /or disingenuous. Donations may be designated as donors wish. In the past, we did have a separate Fox fund and all of those funds were used for Fox, but undesignated funds were used to cover the costs as well. It's that "general fund" where the coffers need to be refilled. 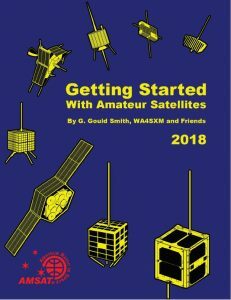 If you donate through the donations page to the general fund, they may be used for any AMSAT project, including GOLF and ARISS. Donations made through the GOLF link will only be used for GOLF and donations made through the ARISS link will only be used for ARISS. We are required by law to use funds designated for a certain project to be used only on that project and we have annual reviews conducted by an accounting firm to confirm our compliance with the laws regarding non-profit accounting. K3RLD, WE4B, AD5NM and 4 others like this. I guess I'll have to rig up something to try and use these satellites. Pretty cool stuff! When do the orbital parameters become available? Love watching successful SpaceX launches and booster recovery landings. Especially when carrying Amateur Radio satellites. Incredibly clear views on this vid of the booster after MECO and separation, and during the landing burn. And they "stuck" the landing on the ship. Reportedly this is the THIRD use of this booster. They also attempted to "catch" the valuable payload faring on the ship for the cleanest recovery, but just missed. Nevertheless, the soft water landing prevents heavy damage and apparently they are now considering reuse after a thorough cleansing. PA3CAC and M0SWV like this. Apparently the Fox-1Cliff amateur radio communications mission is combined with at least three scientific missions from Vanderbilt, Virginia Tech, and Penn State-Erie. What was the total cost for the integration of Fox-1Cliff sat and this commercial launch to LEO? How much of the overall integration / launch cost was shared by these entities? What was the total cost to AMSAT for this launch? AMSAT cannot discuss the cost of the launch due to a non-disclosure agreement. 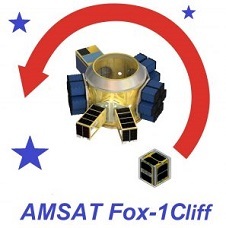 Fox-1Cliff is essentially the flight spare of AO-85 with the addition of the Virginia Tech camera and Maximum Power Point Tracker that were not completed in time for AO-85 plus the AMSAT L-Band Downshifter that was added because there was a spare experiment slot available. University experiments were key in justifying the launch of AO-85 and AO-91 (and the pending launch of RadFxSat-2 / Fox-1E under the NASA Cubesat Launch Initiative), so their presence has resulted in three free launches for AMSAT satellites, but they did not pay any part of the launch costs for Fox-1Cliff. You would be hard pressed to get an actual customer to share this information. This is usually protected by NDA as pointed out by @N8HM. Between who is the NDA made; AMSAT and SpaceX? The integrator? The universities? All the above. What does it cover. Specifics please. I can appreciate the NDA protecting dollar figures in regards to commercial launching becoming a competitive industry, but these are not "actual customers" in that AMSAT is a membership driven non-profit begging for donations, and universities are public institutions. The explanation about the justification and three "free" launches is a bit fuzzy. When were / are those to be? Were those the same academic institutions. Apparently that was a deal with NASA; this one is with SpaceX. Again, IF they are shared, how were the financial obligations for this Fox1-Cliff sat launch divided up between AMSAT and the scientific partners; ball park figures or percentages would be fine. Sorry, "just trust us" doesn't work well for substantial donations. KB2PNN and M0SWV like this.